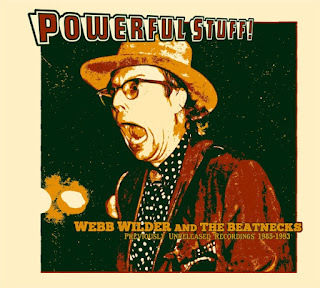 NASHVILLE, TN - Landslide Records is excited to announce an April 27 street date for its next release, Powerful Stuff!, by veteran rock and rollers, Webb Wilder and the Beatnecks. Since 1985, Wilder and his cohorts have been cranking out their own brand of rootsy Rock and ROLL throughout the USA and the world. The band’s energy and intensity is well exemplified by the heretofore unreleased, vintage tracks contained on Powerful Stuff! A potent mixture of roots rock, Americana, blues, and British influences, the album primarily features the “original” Beatnecks: Wilder on lead vocals and guitar; Donny “The Twangler” Roberts, guitar and vocals; Denny “Cletus” Blakely, bass and vocals; and Jimmy Lester, drums. Special guests featured on these rare, unissued tracks include the legendary Al Kooper on organ, acclaimed guitarist David Grissom (Joe Ely, John Mellencamp and Storyville), and renowned bass player Willie Weeks (Eric Clapton, Gregg Allman). Webb Wilder and the Beatnecks will perform at the official CD release party for Powerful Stuff! on Sunday, April 29, starting at 7 PM at Nashville’s Exit/In, a venue where several of the tracks on the new CD were originally recorded live in 1986. The current band lineup includes Webb Wilder – guitar, vocals; Jimmy Lester – drums; Tom Comet – bass; and Bob Williams - guitar. Powerful Stuff! presents timeless live and studio tracks produced by R.S. “Bobby” Field, a founding member of The Beatnecks. Recorded between 1985 and 1993, the material is split equally between original songs and distinctive cover renditions, all of which inexplicably escaped release back in the day. The title track, “Powerful Stuff,” written by Field, is an unreleased Beatnecks original that stayed in the can after The Fabulous Thunderbirds picked it up and made it one of their biggest hits. Other original tunes appearing for the first time include “New Day,” a prescient and timely composition by Webb and Terry Anderson, and a popular concert favorite, “Animal Lover.” The band adds its own distinctive flair to raucous covers of songs by Levi and the Rockats, Sam and Dave, Johnny Paycheck, Little Richard, and Tina Turner. “‘Lost In The Shuffle,’ a tune on the new album, kind of suggests what happened to those tracks,” said Wilder, who is thrilled to finally see them available for his “loving public” and beyond. Compiled and remixed (where possible) by Wilder and George “The Tone Chaperone” Bradfute at his Tone Chaparral studio in Madison, Tennessee, Powerful Stuff! was culled from dozens of recordings that had been carefully stored in a Nashville facility for over 30 years. A native of Hattiesburg, Mississippi, and a member of the Mississippi Music Hall of Fame, Wilder and his friend since junior high, Bobby Field (producer for several earlier records), crafted their signature brand of "Mid-Atlantic" (British and American) rock and roll into their often double-time tunes which separated Wilder’s music from the pack and boasted classic influences from both sides of the pond. The band’s 1986 debut album, It Came from Nashville, a brazenly rocking bar-band rave-up that’s also available from Landslide Records, was recently named one of the top 50 all-time best Southern Rock albums by Paste Magazine.